You may think I’ve been reading a book a day for the last few weeks, what with the frequency of my book reviews. But fear not, I’m only human and I can only manage one book a week except when I’m on holiday or if I’m reading a particularly thrilling book. So most of the reviews I’ve posted have been from my holiday (that’s all the books relating to Sri Lanka and there are still a few more reviews to come) but also including some books I’ve finished since I returned to normal life. You may be impressed to know that I’ve been trying hard to file down my library pile (currently 10 books) and was helped along by a number of reservations hanging over some of the titles. Currently I’m racing through R. Scott Bakker’s first volume in The Prince of Nothing series, The Darkness That Comes Before, which is fabulous. It’s dark, complex and extremely well written and reminds me a lot of Steven Erikson’s epic Malazan Book of the Fallen. Everything you want from a fantasy trilogy. Too bad I can’t read it at a more leisurely pace as I need to return it tonight, but at least it’s kept me reading. 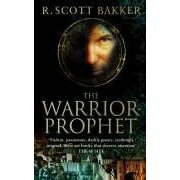 Normally, I’d return a library book if it’s reserved and I hadn’t touched it, but the reason I decided to try and read it in 3 days is because I found the second volume, The Warrior-Prophet, in a charity shop. Yay! It’s actually quite rare to find good SFF books in secondhand shops. I think it’s because, understandably, readers don’t want to let go of them. 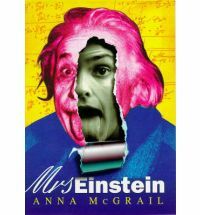 I also got Mrs. Einstein by Anna McGrail about Einstein’s daughter Lieserl born to his wife and fellow student Mileva Maric before they were married. She was given up for adoption and her existence was a closely guarded secret until Einstein’s letters to his wife were discovered in 1986. McGrail has taken Lieserl’s story and shaped it into a quest to gain recognition from her famous father by following in his footsteps and becoming a scientist. Doesn’t it sound fascinating? And from the library this week, I checked out Ian Cameron Esslemont’s The Night of Knives and The Return of the Crimson Guard. Esslemont, together with Steven Erikson, is the co-creator of the Malazan World and his two novels are also set there. I can’t wait to start reading them once I’ve finished my current reads. I’ve noticed that I’ve been reading a lot of mysteries lately and haven’t touched upon any books for the Women Unbound Challenge so maybe I’ll start on one of them soon. So many books, so many choices! And on a final note, I just want to say thank you to tanabata who hosts the delightful Hello Japan! Challenge at In Spring it is the Dawn who sent me a cute little hanging thing in the shape of a tiger for this lunar year as a prize for January’s mini-challenge Music to my Ears. I’ve had so much fun participating in the challenge and urge you to join us if you haven’t yet.